Failure to comply could result in fines or jail time. Following in the footsteps of the state Department of Toxic Substance Control, the city of Vernon has ordered Exide Technologies to clean up high levels of hazardous waste found on streets, sidewalks and storm water catch basins or be fined for city code violations. 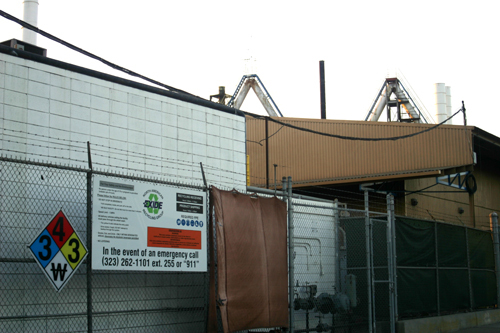 In a letter sent to Exide dated December 18, Vernonâ€™s director of Public Health and Environmental Control, Leonard Grossberg, advised the controversial battery recycler that it has 30 days from receipt of the letter to correct violations of three city codes â€” Sections 13.72, 21.5.1 and 21.6.4 â€” pertaining to the unlawful handling and discharging of hazardous waste within the city, either on the ground or in the cityâ€™s storm drain and sewer system. According to Vernonâ€™s letter, a DTSC dust and soil sampling report dated November 2013 found excessive levels of lead and arsenic at 15 different locations in the city, in violation of city code. â€œSeveral of the levels, apparently deposited on city streets, sidewalks and storm water catch basins exceeded State hazardous waste levels for lead and exceeded soil screening levels for arsenic,â€ the letter states. The letter is a complete about face for the city which until now has repeatedly said it lacks authority to enforce environmental health standards or to take action on Exideâ€™s ongoing hazardous chemical emissions, preferring to instead leave enforcement and punitive measures up to DTSC and air quality district officials. That stance has however been met with harsh criticism by residents and elected officials in neighboring communities who said they could not understand why the city would not just change its zoning codes or other city ordinances to shut Exide down. The criticism comes as the city tries to emerge from past allegations of corruption and being a bad and toxic neighbor. â€œThe city cannot legally say to Exide owners â€˜even though youâ€™ve never violated our zoning codes, because we donâ€™t like you, youâ€™re hereby shut down effective immediately,â€™â€ Porter told the council last September. The city has now decided it does have authority on which to act, citing existing city codes as the basis for its compliance order. The city claims the lead-acid battery recycler has violated city codes prohibiting the unlawful dumping of hazardous waste in the city and for failing to properly dispose of hazardous materials. Similar to DTSCâ€™s order to conduct an emergency clean up of off-site contaminated soil, dust and sediment within 1,500 feet of the plant, Vernonâ€™s letter orders Exide to remove and clean all illegal discharges of hazardous materials at 15 specific locations within the city. The city said testing must be conducted to confirm the removal of the hazardous waste. Both orders come on the heels of a hearing on the Southern California Air Quality Management Districtâ€™s order to shut the facility down until it can safely control toxic emissions from the plant. Hundreds of southeast Los Angeles County residents testified at the hearing in support of shutting down the Vernon plant. While the shut down order being sought by air quality district officials comes with significant financial ramifications for the company, non-compliance with Vernonâ€™s order is less so, with each violation being punishable by a fine of no more than $1,000 and/or by imprisonment in county jail for no more than six months.